Web scraping refers to the process of gathering information from a website through automated scripts. This eases the process of gathering large amounts of data from websites where no official API has been defined. 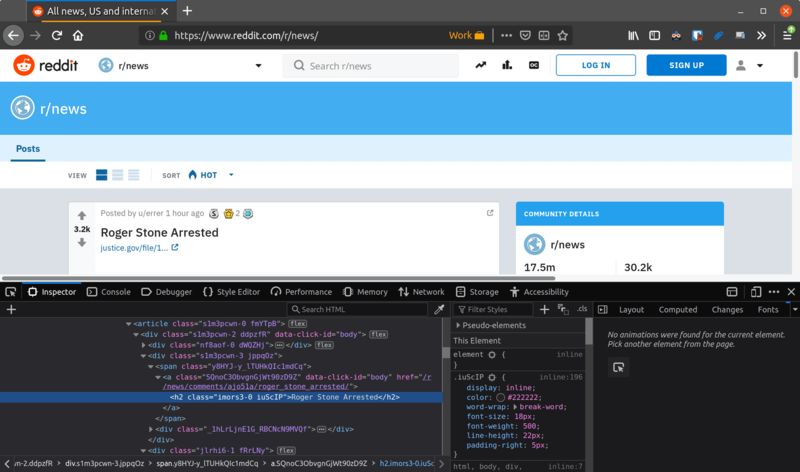 Fetching the HTML source code of the website through an HTTP request or by using a headless browser. Parsing the raw data to extract just the information you're interested in. We'll examine both steps during the course of this tutorial. At the end of it all, you should be able to build a web scraper for any website with ease. To complete this tutorial, you need to have Node.js (version 8.x or later) and npm installed on your computer. This page contains instructions on how on how to install or upgrade your Node installation to the latest version. 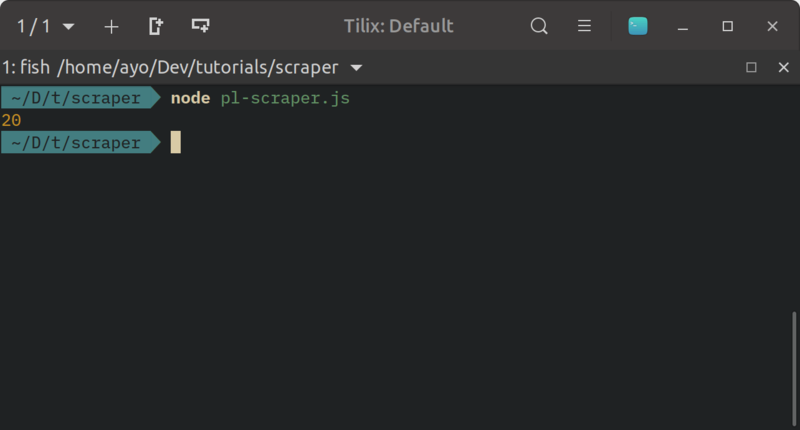 Create a new scraper directory for this tutorial and initialize it with a package.json file by running npm init -y from the project root. Cheerio: jQuery implementation for Node.js. Cheerio makes it easy to select, edit, and view DOM elements. Puppeteer: A Node.js library for controlling Google Chrome or Chromium. You may need to wait a bit for the installation to complete as the puppeteer package needs to download Chromium as well. 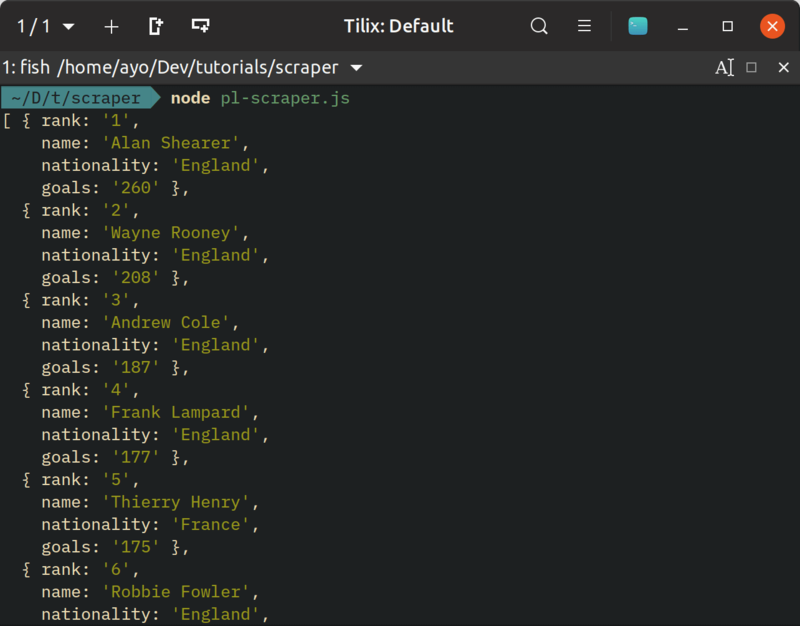 To demonstrate how you can scrape a website using Node.js, we're going to set up a script to scrape the Premier League website for some player stats. 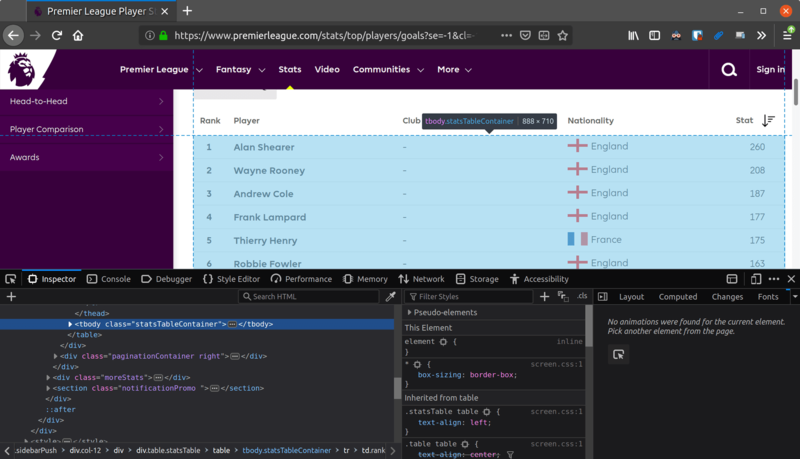 Specifically, we'll scrape the website for the top 20 goalscorers in Premier League history and organize the data as JSON. If you run the code with node pl-scraper.js, a long string of HTML will be printed to the console. But how can you parse the HTML for the exact data you need? That's where Cheerio comes in. Cheerio allows us to use jQuery methods to parse an HTML string and extract whatever information we want from it. But before you write any code, let’s examine the exact data that we need through the browser dev tools. Open this link in your browser, and open the dev tools on that page. Use the inspector tool to highlight the body of the table listing the top goalscorers in Premier League history. Unlike jQuery which operates on the browser DOM, you need to pass in the HTML document into Cheerio before we can use it to parse the document with it. After loading the HTML, we select all 20 rows in .statsTableContainer and store a reference to the selection in statsTable. You can run the code with node pl-scraper.js and confirm that the length of statsTable is exactly 20. It appears, the headlines are wrapped in an anchor tag that links to the discussion on that headline. Although the class names have been obfuscated, we can select each headline by targeting each h2 inside any anchor tag that links to the discussion page. 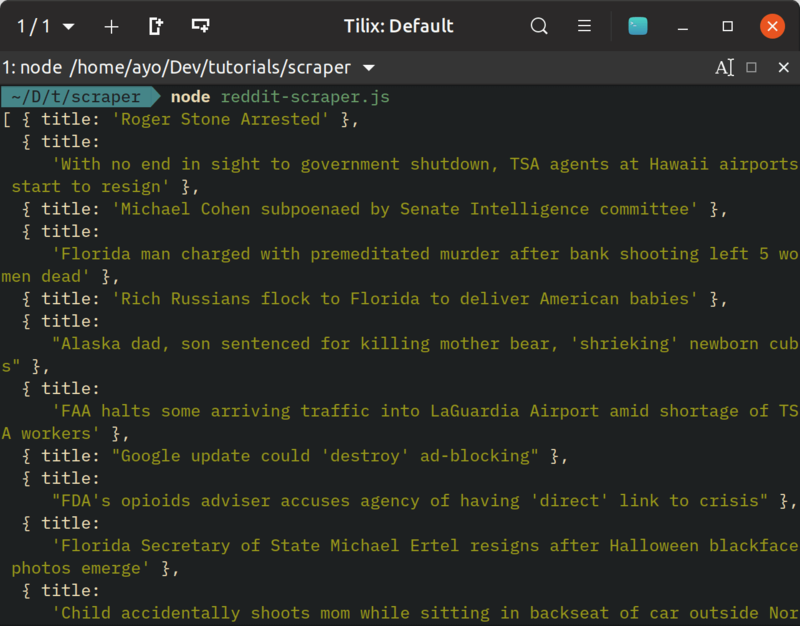 In this tutorial, we learned how to set up web scraping in Node.js. We looked at scraping methods for both static and dynamic websites, so you should have no issues scraping data off of any website you desire. You can find the complete source code used for this tutorial in this GitHub repository.